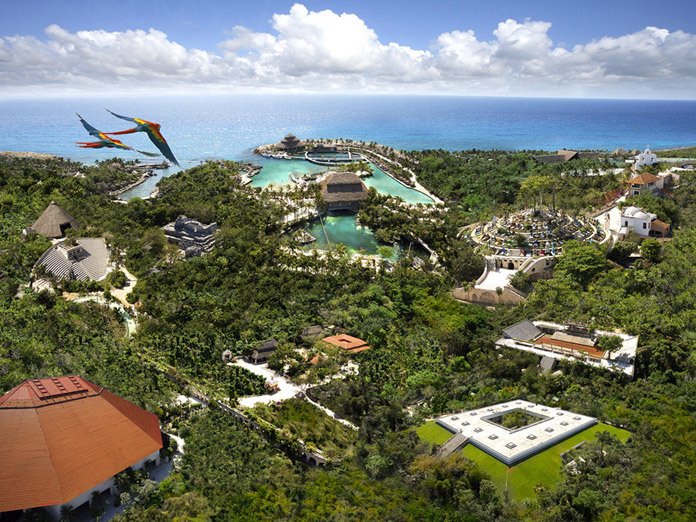 Only an hour from Cancun, Xcaret is one of several eco parks within touching distance. 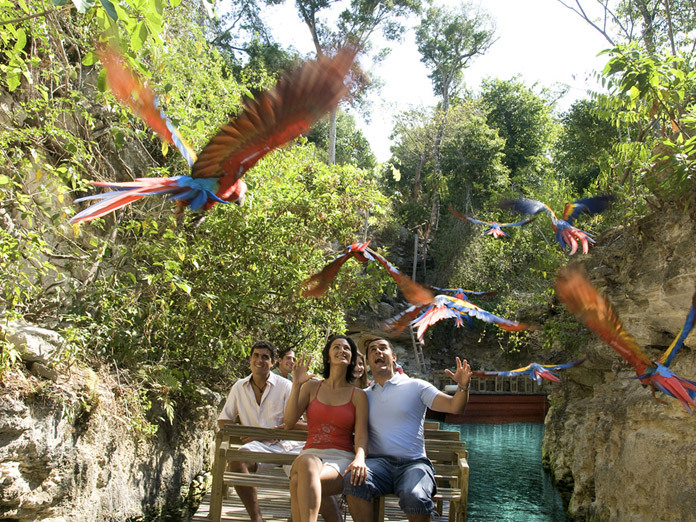 The most convenient and stress free way to visit is by taking one of the many Xcaret Tours, various options are listed below. However, if you’re adventurous you can make your own way there and just buy park tickets in advance for a discount. 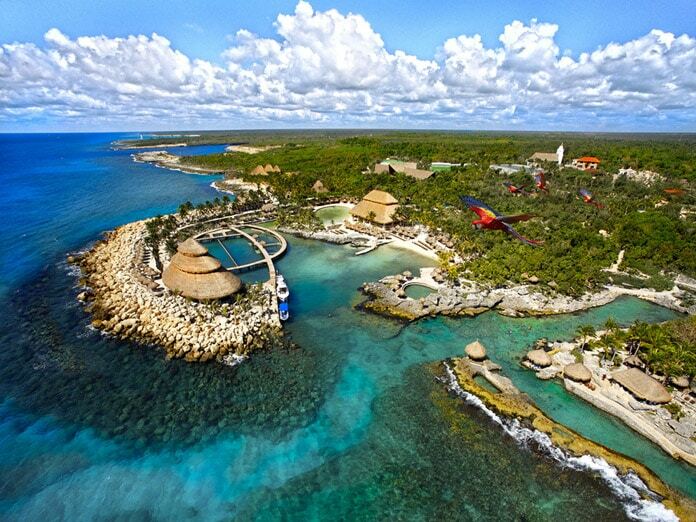 Xcaret Tours are the easiest and most convenient way to spend a day at this beautiful ecological park. 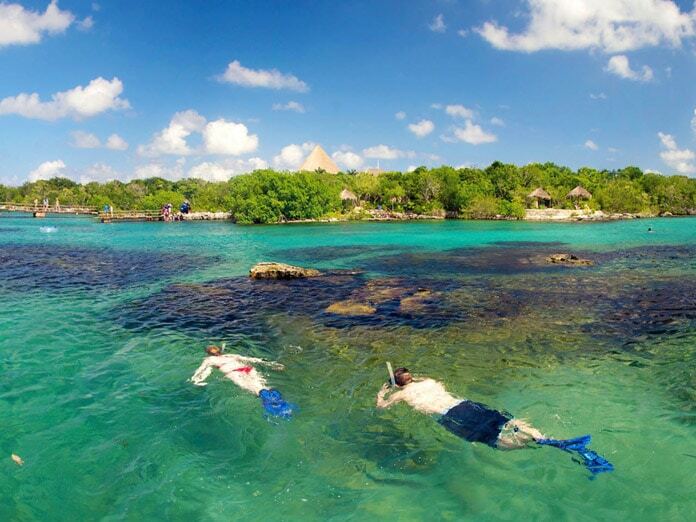 If you have a group, or prefer that personal touch then why not take advantage of an Xcaret Private Tour where you set your own itinerary. 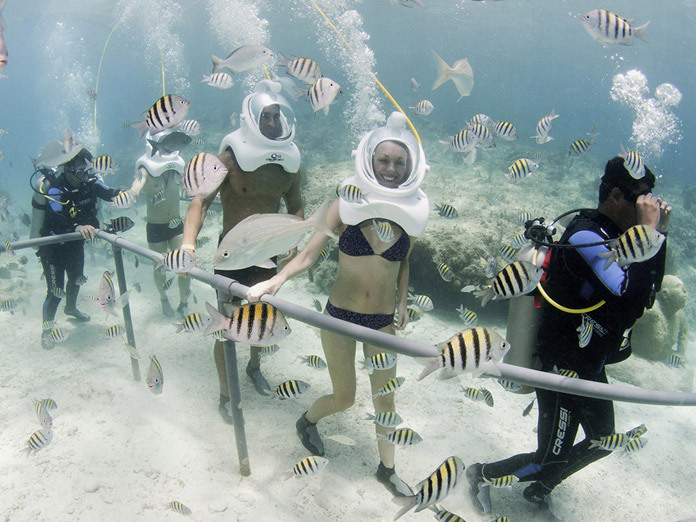 There are a multitude of optional activities you can book once inside the park, including swimming with dolphins, snuba, sea trek, snorkel adventures and other wildlife interactions. Some of these book up quickly, particularly swimming with dolphins so I’d recommend that you book optional activities in advance. This also ensures you the best possible price as the activities are more expensive if you wait to book them in the park on the day. 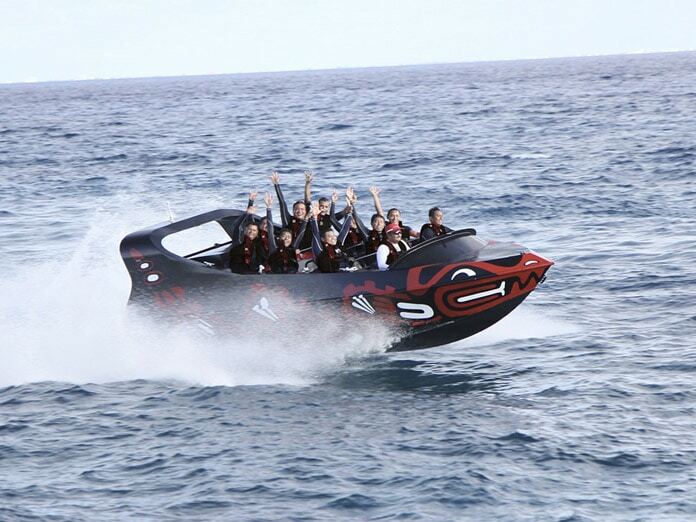 The tours below offer three possible itineraries, an early departure with or without the Xcaret night show and a later departure which leaves the park in the early evening before the night show starts. Pick up from your hotel is either 7:15 or 9:15am. For the earlier departure choose whether to stay and enjoy the night show at no added cost or return as it gets dark. 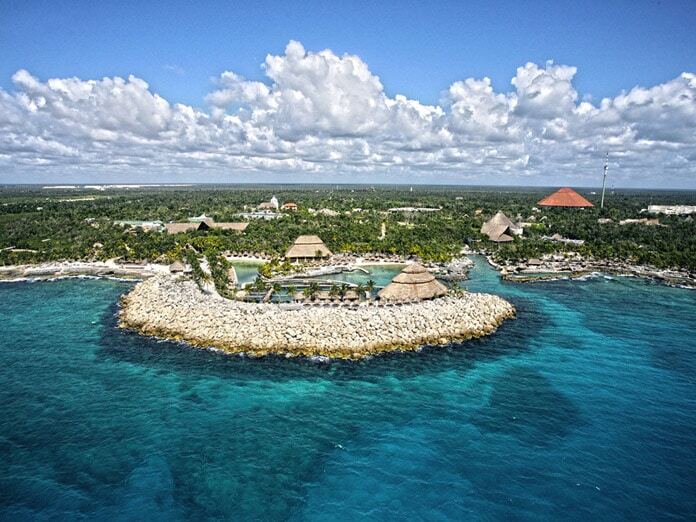 Xcaret Plus includes food and drink, snorkel, towels and locker. Regular option does not. If you don’t stay for the show then you’ll be back to your hotel around 6:00pm. If you do decide to stay for the show you’ll leave when the show finishes around 9:20pm, and be back at your hotel an hour later. Please note that during the winter months, when it gets dark earlier, the show time is an hour earlier and therefore departure back to your hotel will be an hour earlier too. 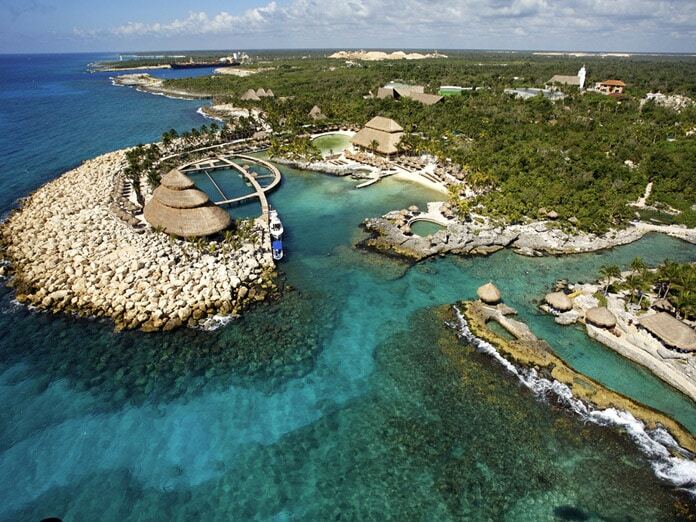 Xcaret Private Tours are the ultimate way to enjoy Xcaret. With a private tour you choose both your departure time and the time you leave to go back to the hotel. This makes it perfect for those who have a group, or who want that extra touch of luxury and convenience. It’s surprising that even with a group as few as 6, a private tour works out to be no more expensive than the regular tour, and with more than 6 you’ll actually save money. Another you’ll find as an option with private Xcaret tours is the option to combine your tour with a visit to Tulum on the same day. You wont find that with the regular tours. 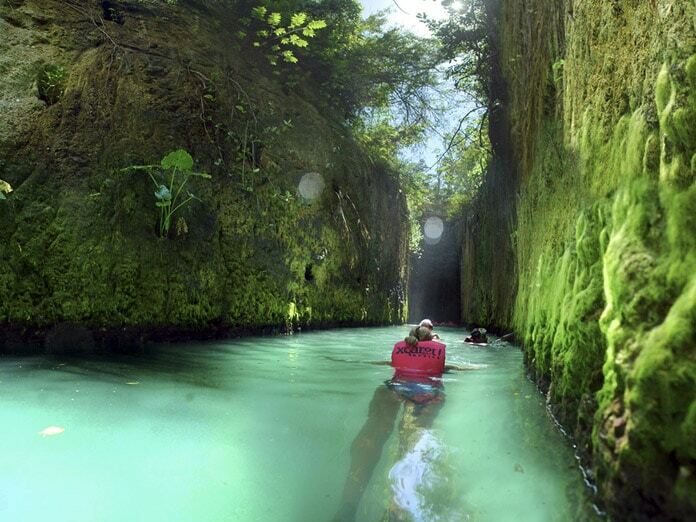 An underground river journey takes you for over a kilometer to emerge next to the gorgeous Xcaret beach. 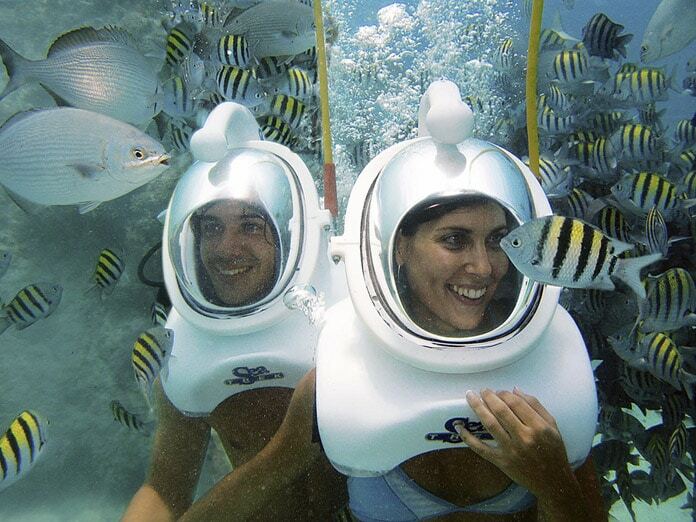 Explore the park, see turtles, the aquarium, big cats, butterfly pavilion and swim with dolphins. 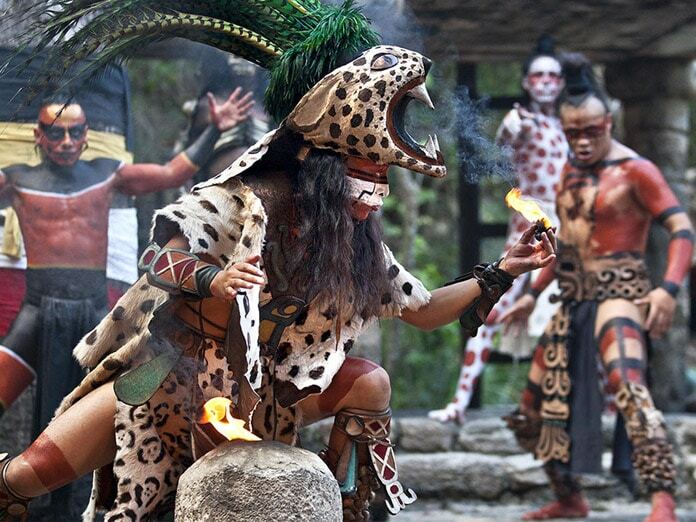 Don’t miss the fantastic night show for a chance to see the ancient Mayan ‘football’ game and enjoy a spectacular pageant in the amphitheater that gives a unique view of Mexico’s rich and varied culture and history. Surrounded by tropical jungle and wildlife you can laze in the natural lagoon. 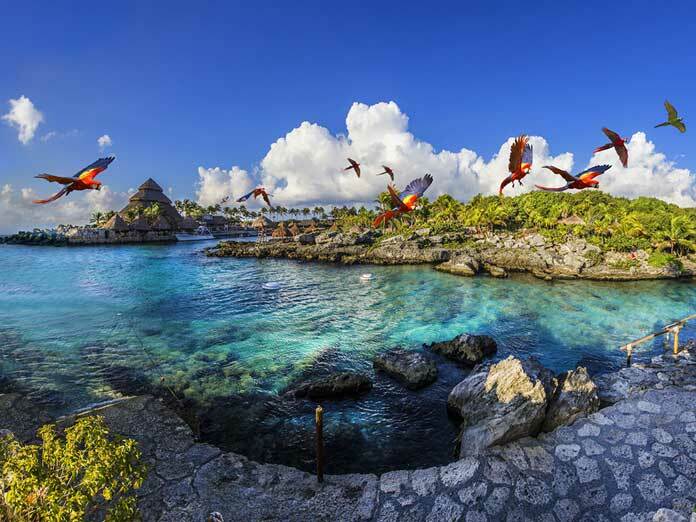 Hundreds of brightly colored tropical fish and the sound of birds floating on the air from nearby islands makes Xcaret a natural paradise. Easy access to the water for children and physically challenged makes this fun for all. 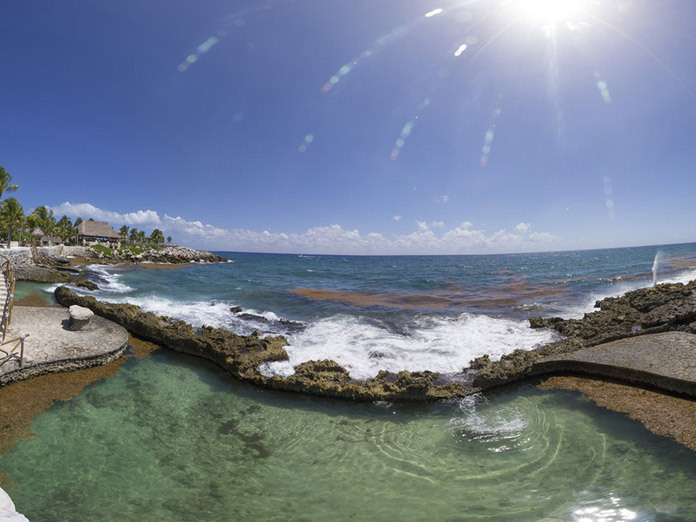 Xcaret has a fantastic aquarium which educates you about various types of reefs and their importance, along with plenty of fish. Saltwater flows freely between the aquarium and the Caribbean, bringing along a variety of marine life. Great for kids. Get up close with a turtle or two, three of the 7 species found in Mexico green turtles, loggerhead and kemp turtles can be seen here in a natural setting from tiny babies to enormous grand daddies. The cold water of two naturally occurring underground rivers provides a sharp contrast to that of the sea and is an ideal way to freshen up. Life jackets and locking bags are provided at the river entrance and your belongings will be transported by donkey to await you at the end of your swim. There are many exits and stopping points along each river so it is easy to take a break and either rest or explore. Even non swimmers will enjoy this. The butterfly pavilion is considered one of the world’s largest, with waterfall, flowering plants and free-flying butterflies, the population is self sufficient. Walk amongst thousands of butterflies in a setting that you wouldn’t realize is enclosed. See and learn all about bats in the dark and mysterious cave at the end of the lagoon. Fruit and insect eating bats can be seen and you will learn about their vital part in jungle reforestation and insect population control. As you walk the park’s leisure trails, you’ll come across many animals. White tailed and temazate deer, coati, badger and spider monkeys live on their own islands. Watch a family of howler monkeys leaping from one treetop to the next and look out for the jaguars and pumas. 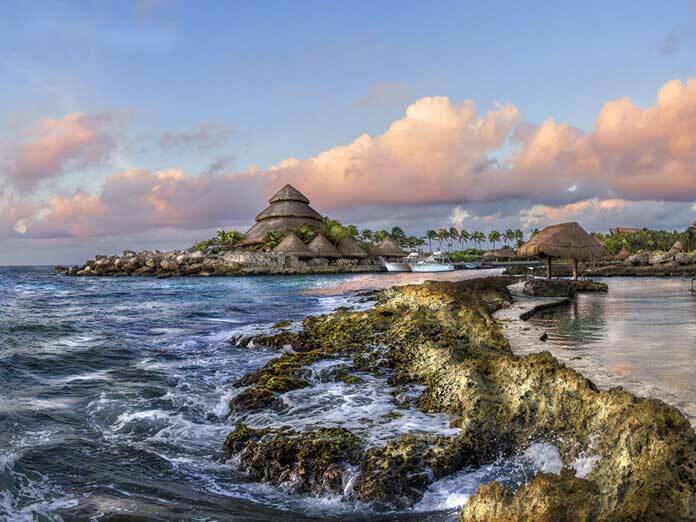 Take a tour of the eight Mayan buildings and learn more about the ancient Maya. 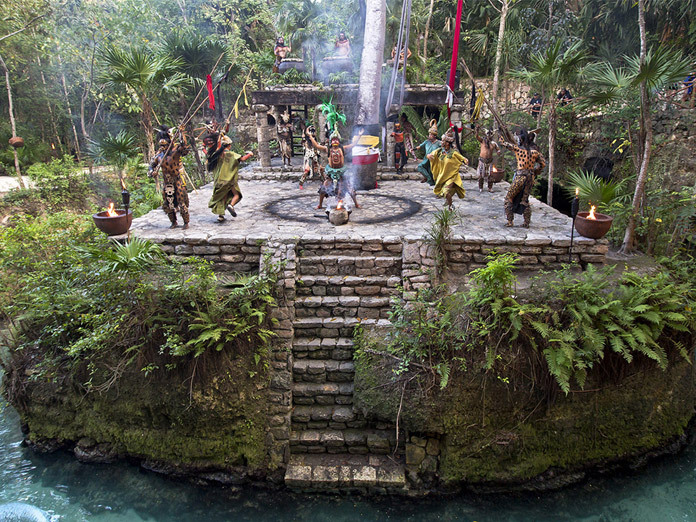 Travel back in time to the Maya which rings an ancient altar. See a traditionally dressed weaver creating handicrafts on-site and a crafter reproducing animals and gods from fallen wood. Taste some Mayan food home cooked by a lovely little old Mayan woman in her authentic house. Tour the Museum’s displays of contemporary and classic art from modern and ancient Mexico, including paintings and pottery and finish by visiting the museum store which sells everything from curios to Mayan textiles. The night show spectacular is an experience not to be missed on your Xcaret tour. The sights and sounds of a grand festival set in Mexico´s golden years together with the mysticism and splendor of ancient Mayan kings. It features a colorful fair, the drama of the Mayan ball game followed by an unforgettable gala performance of Mexico´s regional music and dance. Over 260 performers take part in this incredible pageant that celebrates the rich and varied history of Mexico. Scores of traditionally dressed Mayan characters line the paths as the crowds make their way to the large amphitheater whereupon the night begins with a song from a small Mayan girl who calls on the spirits of the past to take us all through time and visit the roots of Mexico. An ensemble of Mayan leaders take to the stage and exchange gifts before a re-enactment of the famous Mayan football game takes place. Next comes the burning ball game or “Uarhukkua” a variation of modern day hockey, except the heavy ball used is on fire and the players wear no shoes! The following scene is called “Two Worlds Meeting and follows the Spaniards arrival in Mexico and the flight of the native people, through to their evangelization and eventual combination of the two races through music, songs and history culminating in the diversity of present day Mexico. After a short break the second part of the show consists of traditional music and dance from all over Mexico. Commencing the proceedings are nine different ethnic group from the mountains of Oaxaca that participate in a dance parade. 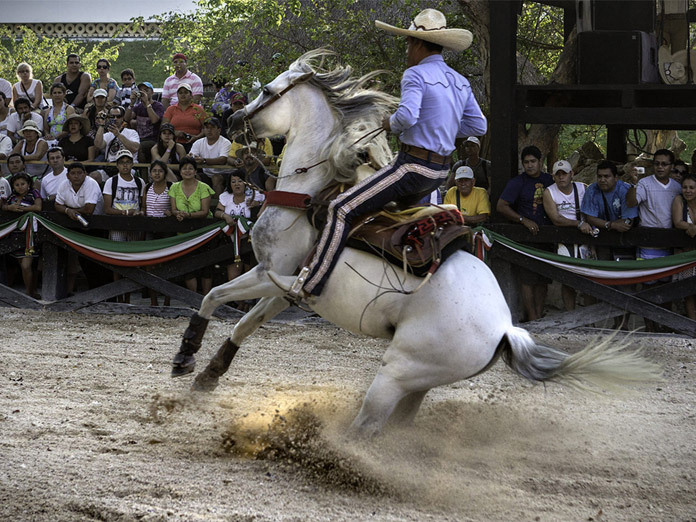 The nearby state of Yucatan which holds the most is the next to be featured in music and dance followed by lively melodies from the coastal region of Michoacan featuring the Danza de los Viejitos “Old men dance” Look out for a surprise on this one! Veracruz is the next state to take stage and both the Fiesta de la Santa Cruz and Carnival of Veracruz is re-enacted along with the famous stampers who dance along to the sound of Spanish guitars. Papantla flyers are the next spectacular, 4 men descend from a 30 meter pole spinning in circles suspended by ropes as they go, while accompanied by the haunting flute of the piper who sits on top of the narrow pole. This tradition is an offering to the God of spring in the hope of a good harvest. Mexico City early in the 20th century follows and the songs dances and characters that marked this period of time are celebrated. The Northern States of Mexico are the next to take the stage with their lively accordion, bass and drum music. 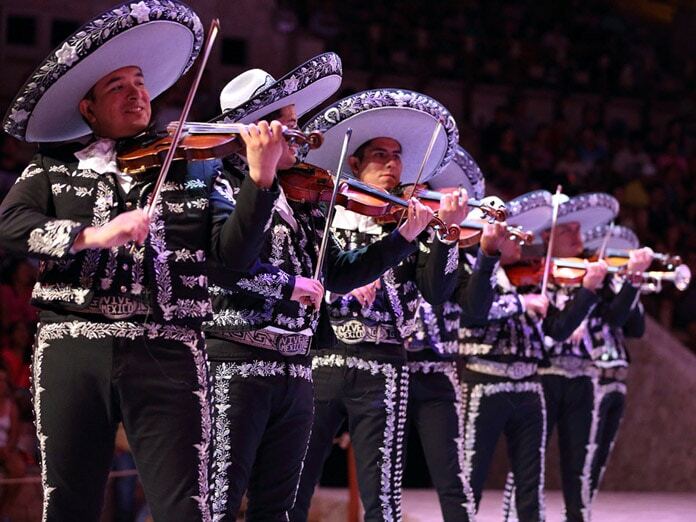 With performances by the Jalisco drummers, demonstrations of lasso skills and the infamous Mariachis the grand finale commences as all of the performers are brought together for one final celebration of the unique country that is Mexico. Xcaret is 43 miles south of Cancun (map below). 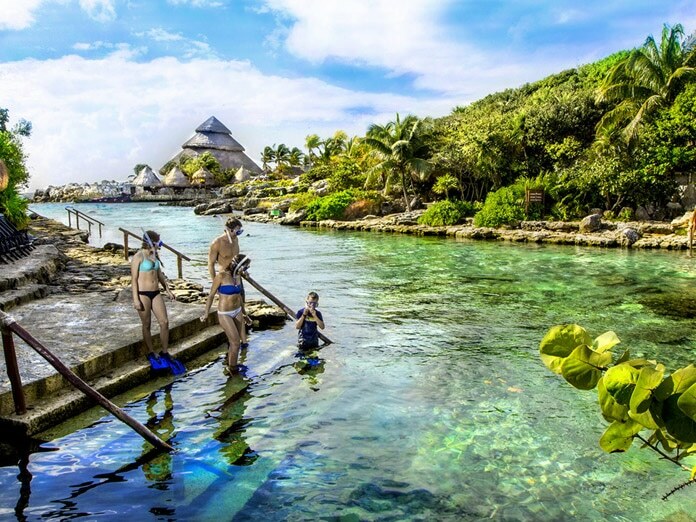 If you prefer not to be constrained by the itinerary of organized Xcaret tours, or you simply enjoy the experience of doing things by yourself then it is not that difficult to make your own way there. If you’re hiring a car then once on highway 307 which can be approached from either end of the Cancun Hotel Zone (but is easier from the direction away from downtown) then it’s just one straight road. 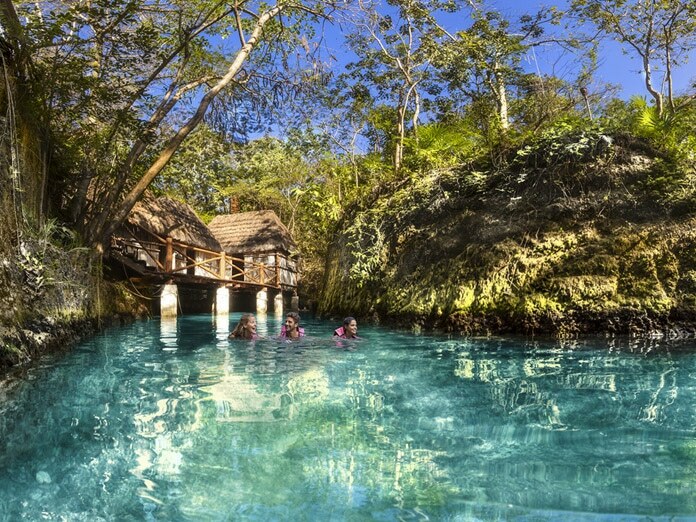 You’ll pass by Puerto Morelos and Playa Del Carmen before reaching Xcaret and the park is just a few minutes drive south of Playa del Carmen. Signposts are very clear and it is hard to miss. Just be careful on that road, particularly if you are not familiar with Mexican driving customs. Highway 307 is nicknamed the ‘highway of death’, and it’s for good reason. If you prefer to travel by bus then the bus station in downtown Cancun provides frequent daily buses to Xcaret, the bus ride takes little more than an hour and costs around $10 per person. The bus stops at several points on the way, and has a 10 minute or so layover in Playa Del Carmen, before recommencing the journey. Buses are clean, air conditioned and often show some awful Mexican TV program on the way! When you’re at Playa Del Carmen make sure you ask the driver to stop at Xcaret, he’ll probably call out anyway but no harm in reminding him to stop. A good tip is to sit near the front of the bus so that you can hear the driver call the names of the various places and you’ll be ready for the Xcaret stop with your bags and possessions. He wont drop you right by the entrance gate, he’ll stop on the main highway so there will be a short walk involved. 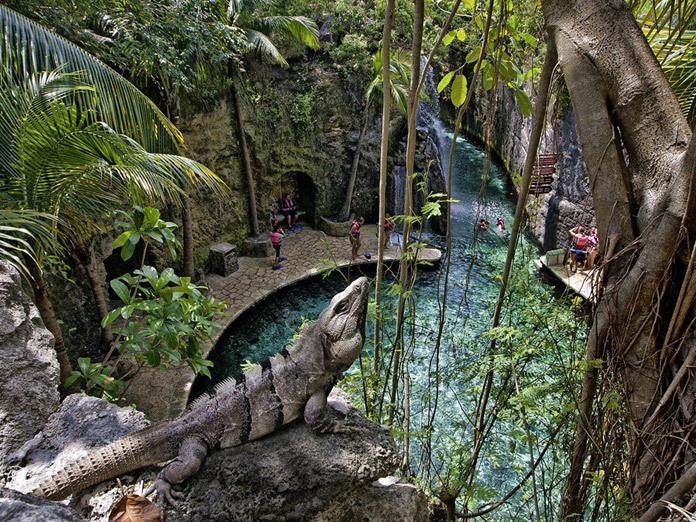 However, there is a little train that will take you right to the Xcaret entrance. On the way back make sure you have some mosquito repellent with you if it’s approaching or after dark. Also be very careful of the road and keep your eyes peeled for the bus as they are not easy to pick out when all you can see are headlights! 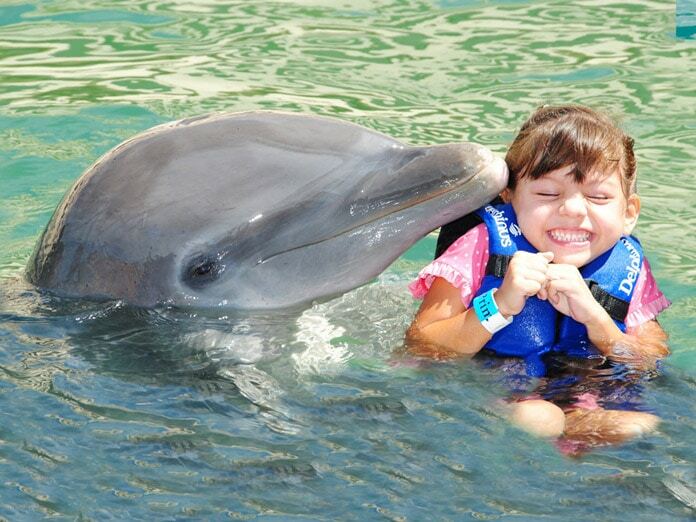 See what Xcaret is all about.